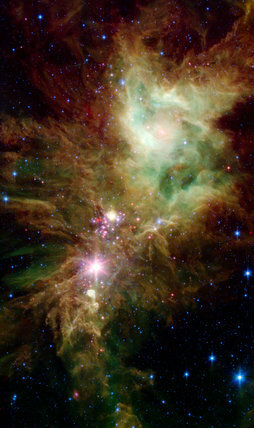 Newborn stars, hidden behind thick dust, are revealed in this image of a section of the Christmas Tree Cluster from NASA's Spitzer Space Telescope. The infant stars appear as pink and red specks and seem to have formed in regularly spaced intervals along linear structures in a configuration that resembles the spokes of a wheel or the pattern of a snowflake, hence the nickname 'Snowflake Cluster'. Star-forming clouds like this one are dynamic and evolving structures. At a mere 100,000 years old, these infant 'protostars' have yet to 'crawl' away from their location of birth. The tip of the Cone Nebula can be seen towards the bottom left corner.